Hi friends! How are you? I hope that you are all doing VERY well. Did you enjoy last week's challenge? I hope it made you think about how you treat yourself and be more aware of taking care of YOU. This week, we are going to one of the things that got me started on this Bring Back Nice movement. Social Media. It is HUGE in today's world! It seems like everyone is on Facebook, Twitter, blogs, Instagram, YouTube, etc... And with being behind a keyboard comes some keyboard confidence. I've read a lot of comments on all sorts of platforms that have stopped me in my tracks. People can be SO mean. I find it appalling that even people who I consider to be nice people will post things on social media that come across mean. I guess it's common place in today's world (how sad!) People will post photos, videos, or statements about other people they've come across in their everyday life for their social media friends to tear apart. Let's judge a picture of what this person is wearing. Let's laugh at this person who fell in a puddle. Let's tear apart this woman's actions in the grocery store. How many of us stopped to think and feel compassion for these people? What if the woman/girl/man/boy wearing those too short shorts doesn't have money to buy anything else? What if that's their only outfit? What if the person who fell in the puddle WAS YOU? Would you want your misfortune placed on YouTube? What if that person who fell got seriously hurt and they ended up dying because of internal injuries? Would you still laugh then? What if the woman screaming at the grocery store just found out she has cancer? Or what if her husband just left her? Or what if she has been up for 4 days straight with her sick child? I get it, these are a lot of "what ifs" and they probably don't apply to most situations. BUT WE DON'T KNOW THAT. I don't know this person, who am I to judge them? This week, I want you to go forth and post positive things on your social media platforms. If posting positive things seems unauthentic to you then I challenge you to bite your tongue and not post snarky things. If you want to go beyond yourself and expand this challenge, then go spread some love. Tell a friend how nice they look in a photo they posted. Leave a comment on your favorite blog or YouTube channel thanking the person for their hard work. Go encourage someone that is taking on a new venture. Kindness is free, spread it everywhere! 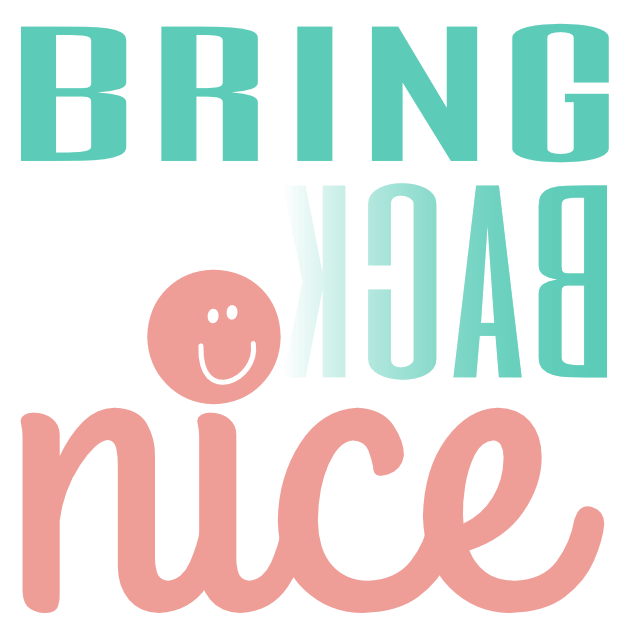 Also, please join us on our Bring Back Nice Facebook page for more encouragement and to share your experiences with us. I think that your efforts to bring back nice are amazing, Ashley. You are doing so much work with so little.Spreading a little "love" and posting nice, encouraging words can change a persons entire day. As YOU have done for me. ♥ Being kind should never be an effort. It should just spread from your heart. :) And, I...love you, my friend. I totally agree with what you have said. What a great idea! I am off to post something nice on Facebook. Thank you!